Hello. 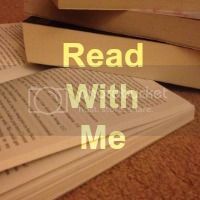 Welcome to another Read With Me. Is it bad that I sometimes like it when the hubby is away because it means I get to read my books in peace?? Anyone else feel like this? I read the Divergent series last week and I have to say it wasn't what I was expecting, a review will be going up next week so keep an eye out for that!! Thanks as always to everyone who linked up last week, I notice a couple of new people joining in which I am more than pleased about. Early Play review Little Cloud by Eric Carle, now I am a huge fan of this author so I don't know why I hadn't heard of this book but I'm very grateful for the recommendation, if you haven't seen it before, then you should definitely have a look now. And the lovely Tattooed Mummy reviewed Farenheit 451, a 'classic' book which I have had on my TBR list for a while and this post gave me the shove I needed to finally start reading it!! Now onto the link up. If you are new to #ReadWithMe then have nosey at what it is all about here. All you old timers know just what to do, link up any book related post that you like, can be a review, competition or even a story you wrote yourself. Please comment on atleast 2 other post which have linked up and I would be forever grateful if you could display my badge or link back in some way. Just posted my first linked posts so thank you for organising. Am looking forward to reading through the other posts tomorrow and - hopefully - finding my next book. Better a bit late than never!! We are having terrible computer issues - well internet issues I think! I have joined into day at No 12. Thanks for hosting and commenting on sites. Hope everyone is having a great week. Thanks for stopping by and leaving a comment on my post about The HoneyBee Man. I had not added your badge but I have now so thank you.